Police began evacuating hundreds of refugees living in makeshift camps in Paris on Wednesday, as European politicians continue to tackle the issue of refugees, which has fuelled the rise of far-right parties in the continent. Reuters Television pictures showed scores of refugees, from the “Millenaire” Camp next to a canal in northeast Paris, waiting to be escorted to temporary accommodation centers. Riot police were also on standby as the evacuation took place. The refugees would be housed temporarily at more than 20 sites across the Paris region while the authorities checked their identities, Interior Minister Gerard Collomb said in a statement. CRS riot police were deployed at dawn, some arriving by boat, as the refugees emerged from their tents and waited patiently to be bussed away from the Port de la Villette Camp in the northeast of Paris. “We don’t really know where we are going,” said a Libyan who reached Paris seven months ago and gave his name as Issam. “It was hard here,” he added, holding on to his one piece of baggage. The “Millenaire” or Millennium Camp was home mainly to Sudanese, Somali, and Eritrean refugees. 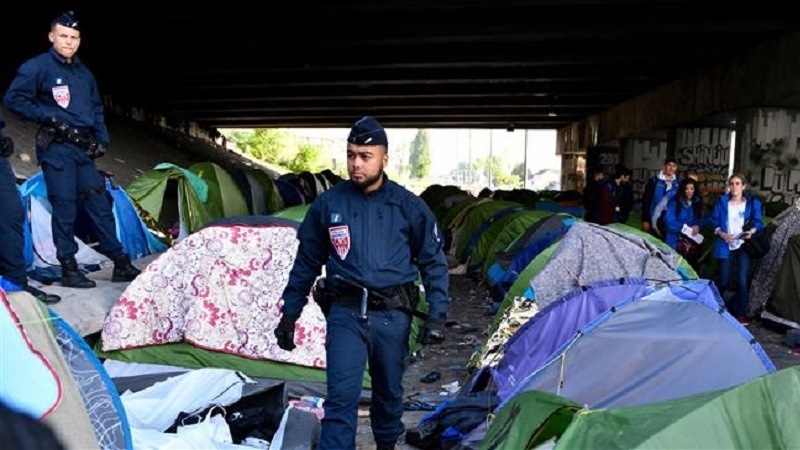 Two similar camp sites in the capital along the Canal St. Martin, which houses 800 mostly Afghan refugees, and the Porte de la Chapelle, home to 300-400 people, would also be quickly evacuated, said regional prefect Michel Cadot. “The other camps will be evacuated as soon as possible next week,” Cadot told reporters. The authorities said the dawn operation Wednesday was the 35th such evacuation in Paris in the last three years as thousands of refugees have arrived seeking a better life. Europe has faced a refugee crisis since 2015 following wars in Libya and Syria, and more than one million people from Africa and the Middle East have tried to reach the continent via Turkey or by sea. French President Emmanuel Macron’s government has said it wants to be both firm and fair on immigration but it took a tougher stance lately, with parliament approving a bill that tightens asylum rules.